I was introduced to NeoStrata, an amazing company based in Princeton, NJ, a few weeks back and I was very impressed with what I found out! This is a company with very impressive credentials. By now, most women have heard that products containing Alpha Hydroxy Acids are very good for the skin, specifically for controlling acne and getting rid of wrinkles! Well, we have Drs. Eugene Van Scott and Ruey Yu to thank for this technology. They actually wrote the chapter in the definitive textbook for cosmetic dermatology about "Alpha Hydroxy Acids, PolyHydroxy Acids, ...and Their Topical Applications". 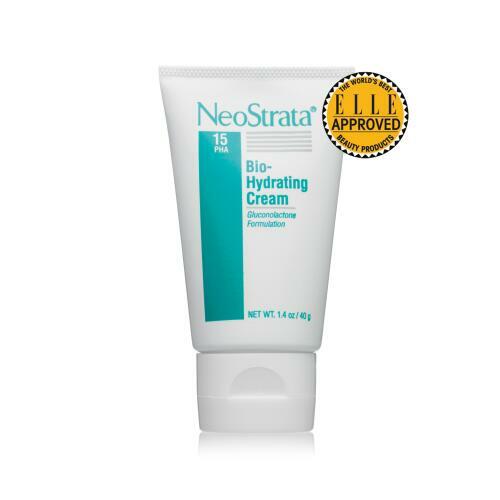 NeoStrata is the company that they have nurtured and helped develop into one of the most highly regarded among skin care experts around the world! "NeoStrata is clinically proven skincare that visibly resurfaces, restores, and refines skin for a noticeable dramatic change." If you have a specific area of concern with your skin, NeoStrata has specially targeted treatments. Some of the most common concerns are age spots, acne and dark eye circles. NeoStrata has effective treatments for each of these areas of concern and more! I tried the Bio-Hydrating Cream, a very gentle and effective cream designed to visibly reduce the signs of aging, while providing long-lasting hydration. The recent recipient of the Elle 2011 Genius Award, this cream is non-scented and very non-assuming. I hardly know that it is there when I put it on, but my skin feels great and non-greasy. This is a lotion for anyone who has had sun damage (hello...too many days in the sun to count!) because it helps preserve the skin's elasticity and suppleness with an ingredient called Gluconolactone. Like I said, I was very excited about the results. My skin IS more supple-looking and I like that! Hmmm....I wonder what else they have? I do know that if I order just one dollar over $75, I will get free shipping and 3 free samples! And if I order over $100, I'll get a FREE SPF15 Daytime Protection Cream! Besides their amazing anti-aging line, NeoStrata, there is also Exuviance for dramatic transformation of all skin-types, Coverblend, a make-up that covers even major scars and NeoCeuticals an advanced treatment plan for acne. Check it out! You can keep up-to-date with their latest promotions and chat with Twitter and Facebook! I am going over to check them out now.... I sure do need to reduce the signs of aging. This sounds like something I sure could use. Would love to give it a try. Thanks for the information. This sounds awesome! I love being in the sun but hate the affects of it. Thanks for the review.